We live in t he woods where nettles grow everywhere. My kids have become pretty adept at spotting them but that does not mean we don’t have regular run-ins with these stinging weeds while tromping around. I know they are not everyone’s favorite plant, but I want to make a pitch for nettles because I have come to love them over the years! Now I look forward to spotting them as one of the first signs that spring has really arrived and sunshine is (hopefully) not far behind. So every year when the nettles are perfect I have a dear friend who comes to visit and we make a spring weekend of harvesting and cooking with nettles. I love that now the kids remember and look forward to it. Maybe this will become your new family tradition too! Nettles are so delicious! Another friend who used to live in the mountains but has since moved to the city recently confess to me that he bought nettles at the local food coop last week because he loves them so much and couldn’t find them growing near his house. That made me laugh because there are some things that it kills me to pay for at the grocery store – zucchini, rhubarb, nettles. If you find yourself tempted to pay for these delicious greens just come visit me and I’ll hook you up. One of my favorite health benefits of nettles is that they help relieve hay fever symptoms. I just think it’s so magical that at a time of year when the pollen count is high and allergies are prevalent nature also provides this great remedy! Nettles are also an anti inflammatory and have been found to help reduce joint pain and the effects of osteoporosis. It is also used as a diuretic and to reduce eczema. Nettles are also high in iron (I swear I feel stronger after drinking nettle tea) and a great source of bone strengthening calcium! A warning though – nettles are not considered safe for women who are pregnant as they can lead to uterine contractions. The first thing you have to do when working with nettles is to find them! This can be a great spring treasure hunt to do with the kids – plus it helps them learn what they look like so they can avoid getting stung. Nettles often grow in the woods on the edges of disturbed areas like clear cuts or roads. If you are uncertain if what you are looking at is a nettle you can always ask for a volunteer to touch one and find out (just kidding. Don’t do that. Try looking it up in a plant book. This is my favorite one). It is best to harvest nettles within the first couple weeks of seeing them come up. This is when they are most tender and scrumptious. Use gloves and scissors and maybe tongs if that’s helpful. Bring a bag to collect them in. Nettles will cook down a lot so you will probably want to gather more than you think you’ll need. The first thing to do when working with nettles is to take the sting out of them so that you can work with them and eat them without getting hurt. There are two easy ways to to this – blanching or drying. The first thing I like to do is give them a good soak in sink of cold water. This will wash off any dirt and soak off any little bugs that might have decided to journey home with you. If drying nettles for tea at this point you can put them on your dehydrator in a single layer and just let them dry out overnight. In the morning put them in a container and you’ve got nettles for delicious nutritious nettle tea – just use them like you would loose leaf tea. If blanching put a large spaghetti pot on the stove and bring the water to boiling. Next (remembering to use your tongs!) transfer the nettles into the spaghetti pot. They only need to be in the hot water for a minute or so to take the sting out. After that you can lift them out with the spaghetti strainer and place them in another bowl. I like to do it this way for a couple of reasons 1) because they will cook way down once their in the water so you’ll want to process more than one batch in the boiling water 2) the water that you blanch them in is extremely yummy and nutritious. You’ll see it changes to a deep brown color – don’t throw it out! Drink it like you would hot or cold tea. At this point the options are endless. You can use the blanched nettles any way that you would use spinach. If you have more than you can use right away it freezes beautifully. One of my favorite ways to use it is to make nettle pesto. My homesteading friend Corina has this delicious and simple recipe. Other ideas are to use it in place of spinach for lasagna, blend it in green smoothies, use it in baked goods, use it as an omelette filling. Or just saute them with a little butter and garlic and they are delicious on their own. If you do this last one no need to blanch first – cooking them over heat will also remove their sting. Have fun and get creative! I’d love to hear if you have other ways you love to use this delicious and oh so healthy plant. Be happy, be healthy, be well! Annual nettle pesto feast – kid approved! Pulling together the ingredients for pesto. Nettles will cook down a lot during the blanching process. Spread in a single layer on your dehydrator to dry for tea. Want to be part of the conversation about how to live a healthy, happy life? For lots more tips and tricks and some great conversations come on over and like the Wellspring Facebook page and sign up to receive Wellspring’s monthly newsletter. 5 Ways Spring Cleaning Can Actually Make You Healthier! Hello spring! It’s that amazing time of year when the plants start to grow, the birds return and the sun starts to come out. Here in the Pacific Northwest even the shortest stretches of sunshine are enough to make everyone feel a little loopy and start walking around in shorts. It makes me want to throw open all of the windows, get rid of all the extra clutter that has accumulated through winter nesting and scrub things clean! You know that satisfaction when the house is picked up and you walk around just feeling great? (I admit it’s a rare occasion in my house, but when it happens I thoroughly enjoy it!). Well it turns out there are some actual physiological health benefits to doing your spring cleaning. Research has shown that when people feel their homes are relaxing and restorative there is an actual link to lower cortisol levels (the hormone our body produces when we’re stressed out) and decreased depression! According to a Cornell University study when your kitchen counters are free of clutter you are likely to eat significantly fewer calories! Opening your windows wide helps to combat indoor air pollution and lessen allergies and asthma. Cleaning – especially the bigger chores like scrubbing the tub and mopping -can be a great way to burn calories. Crank the music and work it! Exposure to sunshine helps the brain release seratonin – a hormone that helps us feel happier and sleep better. So scrub those windows and let the sun shine in! Want a little reading inspiration to help you get motivated to start your spring cleaning? Check out my book review of The Life-Changing Magic Of Tidying Up: The Japanese Art of Decluttering and Organizing. Embrace your spring cleaning itch not only for your happiness, but also for your health. (And while you’re at why not toss some of those toxic cleaners lurking at the back of the cleaning closet and try out some of these ideas for natural DIY cleaners?)! Happy spring! Be happy, be healthy, be well! For more tips tricks and inspiration for a healthy happy life sign up for my monthly email newsletter. Or join in on the conversation about health and happiness over on my facebook page. Do you have a creative idea simmering inside you that seems to keep getting pushed aside for whatever reason. Maybe it feels too much like play and not productive enough alongside all of the other things you need to get done. Maybe you feel like there was once a place for creativity in your life when you were younger but now that isn’t really practical – even though you used to love it. Maybe you feel like you aren’t quite good enough to pursue your chosen creative endeavor, like you should just leave it up to people who have decided to make a career out of it. I’m telling you. Go pick up a copy of this book. Now. In her book Big Magic: Creative Living Beyond Fear, Elizabeth Gilbert clearly explains all of the reasons we self-sabotage and then beautifully but also in a no nonsense kind of way helps us to see why we should forget about all of that and pursue our creative dreams. In her book Gilbert addresses the fact that art and anguish have often been seen as compatriots but argues that it doesn’t have to be that way. That it is possible and ideal to find joy in the creative process. That it is in fact the process and not necessarily the result that is the point. She also has some great ideas for those times when you’re feeling less than inspired and need a little help finding that spark. This is a beautifully written, very inspiring, fun read. So next time you can’t quite muster the motivation to go into the gym but you still want to do something good for yourself try pulling out your sketch pad or your guitar and lose yourself in a little creativity. Interested in some inspiration and guidance in creating a beautiful vision for your life and goals to get you there? My next Crafting A Wellness Vision workshop starts in just a two weeks. Register now to be one of 20 women in this supportive, coach-led workshop. Each day you will spend 10-15 minutes completing exercises and journaling prompts that will guide you in the creation of an intentional vision for your health and happiness. Check out my workshop page to hear from past participants about the program. Often when we talk about taking care of our health and wellness the first things to pop into our mind is food and exercise. Of course taking care of those things are essential to being healthy, but just as important (and possibly more) and less talked about is making the time to take care of our mental health. It’s because of this stigma that I believe a lot of us don’t even really pay attention to our mental state until it does feel like we’ve reached some kind of a breaking point. But taking care of our mental well being should be part of our regular health routine just like eating healthy foods and getting moving. Recently I did a series of interviews with women about their greatest challenges when it comes to their health and wellness. While some challenges relating to food and exercise certainly came up what was fascinating to me was that almost across the board challenges relating to mental health took center stage in our conversations. Let me just say that all of these women are amazing, whole, intelligent, beautiful, inspiring women and are in no way broken. I think if we are really honest these are real struggles most of us face. So what are a few simple things that we can do to take care of our mental well being? Meditation – You probably know by now that I will always suggest meditation as an truly effective way to take care of our mental well being. There are lots of resources out there to get started. Look in your community for in person classes or try this great free app that I love. Yoga – Yoga is great because most classes are a blend of exercise and paying attention to our mental state and will incorporate meditation and relaxation techniques. If you are looking for a way to try yoga for free at home check out the YouTube channel for my favorite online Yogi Adriene. Gratitude Journal – I love gratitude journaling because it is such an easy accessible way to shift us into the positive mindset. At the end of each day jot down three things that you are grateful for and make you happy. As you fall asleep your mind will focus on these positive things rather than all of the worries and stresses of the day. Digital Detox – This is one that I personally struggle with at times. But taking time away from our screens to look up and pay attention to the world around us and take a break from being bombarded with all of the information on our news feeds can do wonders for helping us to feel less stressed and more relaxed. It can help us reconnect with what’s important in our lives including the people around us. Write Down Dreams and Goals – Feeling swept up in life or unsure about decisions is very common. The antidote to that is to take time to carefully create a vision of what you want your life to look like. Once you have a vision your creative brain will start coming up with ideas for how to get there – your goals. Creativity for the Sake of Creativity – This one I love because I think it’s one we don’t talk a lot about and can be so wonderful for out mental health and happiness – especially if we can let go of our expectations for the final result. I love watching my preschoolers immerse themselves in their art projects. They aren’t trying to make something to impress the world. They are just truly in the moment enjoying the experience of creating. Exercise and Eat Healthy – Ha! The irony is that it’s all tied in together right? I know for me personally sometimes exactly what I need to get into a good mental state is to break a sweat and eat better. These are just a few ideas. There might be others that work better for you. I like taking informal surveys when I talk to people to see how they attend to their mental well being. For some it’s making time for a quiet cup of tea. For others listening to their favorite music at full blast in the car with their eyes closed. Try picking just one thing to do a day for your mental health (just like you would for your physical body) and experimenting with it. Tune into your thoughts and notice if you feel happier, more focused, confident, settled afterwards. I’d love to hear your favorite ways to take care of your mental health. Be happy, be healthy, be well. Would you like some help creating a beautiful vision for your life and goals to get you there? My next Crafting A Wellness Vision workshop starts in just a few weeks. Register now to be one of 20 women in this supportive, coach-guided workshop. Each day you will spend 10-15 minutes completing exercises and journaling prompts that will guide you in the creation of an intentional vision for your health and happiness. Check out my workshop page to hear from past participants about the program. Have you ever noticed what a “heavy” topic health and wellness can often be? It seems like articles and studies are published daily demonstrating links between serious diseases and conditions and our lifestyle choices. Terrible things that will happen to us if we don’t exercise and eat the right things, if we don’t get enough of certain vitamins. If we allow too much stress in our lives. If we are exposed to too many toxins. On and on! It can feel like a war that we have to wage just to desperately cling to our health! Or like a hopeless battle that we’ll never win no matter how hard we try. The implication can be the more unpleasant something is the better it is for us. It’s the “no pain, no gain” or “you have to suffer to be beautiful” attitude. What can you do to be joyfully well? What foods do you love AND are healthy for you. What hobbies can you take up that get you moving AND make you happy? What kind of self care can you do that makes you feel relaxed and pampered instead of tortured and miserable? Because here is the thing. To truly be well we have to shoot for our relationship with health and wellness to be a life long love affair. You may be able to force yourself to drink a horrible green concoction that you hate for 30 days but unless you find the joy in it what is going to happen after that? Most likely no matter how stubborn you are you will not keep it up your whole life long and thirty days does not a lifetime of wellness make. That is not to say that joy and easy are synonymous. For me personally it might be easier to sit and veg out to a movie but I know going for a beautiful trail run with a friend, although “harder”, is going to feed my soul, bring me a greater amount of joy AND contribute to my well-being. For some people it’s dance. For some hiking in the woods. For my sister anything to do with boats. For my husband skiing and mountain biking. Sometimes remembering how we loved to play when we were children and finding ways to do more of that in our adult lives can do the trick. Wellness is not a quick fix. It’s like any kind of relationship. You can suffer through a bad one for awhile but over the long haul it will make you miserable and it won’t last. The challenge is to create a relationship with wellness that makes you want to be with it for the rest of your life! So that you can see yourself growing joyfully old together. Registration is now open for my Crafting A Wellness Vision Workshop starting 4/1/17. 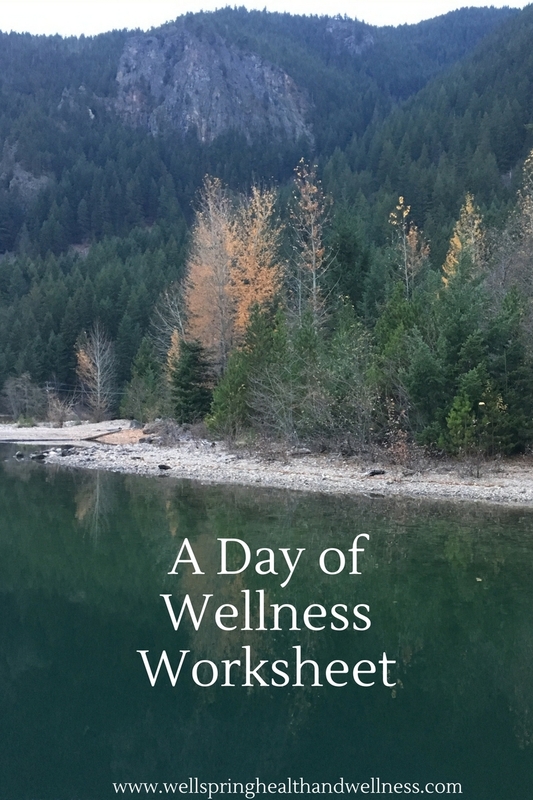 Join the next cohort of women creating personalized thoughtful approaches to health and wellness through a series of daily coach guided journaling prompts and activities. I know the feeling. It’s that feeling of overwhelm, like there is so much on your plate that you just might get swallowed up and yet with so much to do you don’t quite know where to start or have the energy to do it if you did. You start to get grumpy with the people around you, it feels like the universe just might be conspiring to make you crazy. Is this what you signed up for? Start the day by doing something loving for yourself – It’s not selfish or self indulgent, it is setting the tone for the whole day. This could be brewing yourself a cup of tea and making time to just sit and drink it quietly, taking a shower with new soap that you love, getting some exercise, meditation, journaling, reading a chapter of a good novel. Whatever it is that feels like self love to you do it! Here’s the catch. If you have kids that wake up at the crack of dawn or you have to be in at work by a certain early hour this might feel impossible. I’m telling you now. It’s worth setting the alarm clock earlier. An act of love for someone else – Okay, you’ve gotten up. You’ve reminded yourself that you are a human worthy of love and done something to prove it. Now it’s time to spread that around. Tell your children specifically why they are amazing, make your husband a cup of coffee when he’s not expecting it, text your friend to let her know you are thinking about her. It seriously takes almost no time at all, but can make a huge difference in that person’s day and magically I promise it will make a difference in your day too. Do one small thing – Here is the thing to remember. Sometimes just getting started is worth a lot more that starting in the “right” place. In fact I personally am not convinced that there is a “right” place. I think sometimes we get so hung up on getting it right that we just get paralyzed instead. Sometimes any progress is enough to break us free of paralysis and get us moving. So stop and think about the big picture for a minute and then pick one thing that moves you in the right direction. One drawer to clean out, one chore to complete, one phone call to make, one email to send and see where that takes you. Go outside – Now you’ve made a little progress. Good job! It’s time to go outside and breathe some fresh air. I know that you think it’s too much work to get the kids bundled up, or that you can’t pull yourself away from your desk and computer. Listen. It is ALWAYS worth it. It might be pouring outside. You are still going to feel better after getting out and moving. In the workplace there can be this funny culture where people are worried that others are going to think they are shirking their duties. I even felt that when I worked for an environmental education organization whose whole point it was to get people outside more! But do it anyway because not only do we all deserve breaks, being outside and moving for awhile will actually clear your head and make you more productive and creative. Take your boss with you on a walking meeting if you have to. End the day early and with gratitude – You’ve done a good job. Top it off be taking some time to appreciate the good parts of the day. Take it one step further and write them down. Recognize the ways in which you are truly blessed. Now turn off the phone and get to bed early so you will feel rested enough to get up and make time for yourself again in the morning. Repeat from step 1. We all have times when our energy is low. When it feels like inspiration hasn’t visited for awhile. That is totally normal. But when you get to the point where you don’t want to feel that way any more it’s time to make some changes and you have the ability to do it. They don’t always have to be major. I know sometimes it might feel like you need to overhaul your entire life and move to Italy to study bread baking (whoops, that was one of my fantasies), but often the smallest shifts in our actions and thinking make the biggest difference in our lives. Join the Wellspring community of women seeking ways to make time for their health and happiness while leading busy lives. Sign up for Wellspring’s monthly newsletter for inspiration delivered direct to your inbox. Today I thought I would try something a little different. You know me, I love talking about food. I love reading food blogs and articles. I follow countless healthy foodies and food stylists and I drool over the glorious pictures of fresh beautiful food that looks so gorgeous. I do often get inspired to try new things because of it, BUT I’m also a mom and a business owner and I know how busy life can be. Realistically I am not going to spend hours perfectly placing each goji berry in my smoothie bowls. One of my favorite food resources for inspiration is Lisa Leake who founded 100 Days Of Real Food. The reason I originally found her was because she has a photo gallery on her website where she snaps a quick picture of the lunches she had packs for her girls each day. As inspiring as the beautiful food stylist photos are I’ve found Lisa’s school lunch pictures to be a million times more helpful and practical in my regular day to day. Top Left: The boys making black bean brownies. There are a million black bean brownie recipes out there. I’ve had some pretty epic fails in this department, but the one we’ve been using and loving lately is this Flour less Black Bean Brownie by Chocolate Covered Katie. My kids get excited by even being in charge of the smallest job. This recipe is so easy that all there is to do is dump the ingredients into the food processor and push the button. But even that is exciting for them, and the pride they have when they eat something that they helped cook is really fun to see. Top Right: I know it sometimes seems like more work to involve the kids with the cooking but how many times have you been trying to get dinner on the table with the kids clamoring in the background with a million requests? Trust me it is much easier to give them a knife and some vegetables to chop. Ha! Okay maybe that sounds strange but check out these salad knives made for kids you can find on Amazon. They are still a little sharp and require some supervision, but if you are selective about what things you give them to chop (think start with banana) and talk about knife safety as you go, it’s a great skill for them to develop early on. There are also some good you tube videos for kids on how to use knives safely that you might think about watching together before jumping in. Kids will take forever carefully chopping peas or peppers leaving your hands free to finish up the rest of the dinner prep. And as a bonus I’ve noticed in our house it’s common for vegetables to get nibbled on along the way – so maybe a good way to encourage those kiddos who aren’t so sure about veggies? Bottom Left: Making your own tortillas is a really fun project and so easy. We picked up our tortilla press years ago at a local Hispanic food store. I think it might have been $10, but you can also find them on Amazon. Look for masa in the Hispanic food section of your grocery store. It’s magical for the kids to put the balls of masa on the press and lift it up to find perfect tortillas. They are delicious (way better than store bought in my humble opinion) and an added health benefit is you know exactly what is in them – a surprising number of tortillas in the grocery store are loaded up with preservatives to help keep them shelf stable. Here is a link for an easy tutorial if you are looking for more directions. Bottom Right: On Valentines Day the kids wanted to make heart shaped pizzas. What kid doesn’t love pizza? And by making your own at home you can make it so much healthier! You can of course make a delicious crust from scratch if you have the time. But if you are looking for something quicker for a mid-week meal one that I’ve found and like is Trader Joe’s Whole Wheat Crust. It just has 6 ingredients – all recognizable – and the same ingredients that I would use if I were making it from scratch. The other great thing about making pizza at home is that kids LOVE to put the toppings on so put bowls of chopped vegetables in front of them and you might be surprised just how many veggies end up on your pizzas. On this day our pizzas had grated carrots, chopped red pepper, pineapple, and artichokes. Delicious! I’m determined that when my boys go off to college they will love to cook and will know how to do it well. This is a gift that my mom gave me and it’s important to me to pass that on to my own kids. It is a skill they will be able to use every day for the rest of their lives. It doesn’t have to be complicated. Even the simplest cooking projects done on a regular basis is really exciting for them. Yes, sometimes it’s easier to do it myself but when I see how much they love to be a part of it, how it encourages them to try new foods, and how proud they are of what they’ve done it’s worth it. “Mom! I think this tastes better because I helped!” Is something I hear a lot in my house. What are your family’s favorite projects in the kitchen? I’d love to hear about them! For more tips, tricks and inspiration for leading a healthy happy life sign up for my monthly newsletter. Life is busy. Does it ever feel like your to-do list is endless and ever expansive? Like you cross three things off, but add five more? Our days and attentions are fragmented – pulled this way and that between running errands, taking care of children, working, picking up at home, trying desperately to keep up with friends. Monotasking seems like an antiquated, slow moving idea. All the while our monkey minds work overtime in the background giving us a running commentary on how we are doing, what we should be doing, how that last conversation should have gone, what next thing on our to do list needs to be crossed off. You need a break. Your brain needs a break. You are not a robot. You cannot keep up this pace indefinitely until the kids move out! You will break down at some point. But how? Well you probably know me by now. I’d recommend starting out by trying meditation. But what if meditation isn’t your thing? I have a dear friend for who the just thought of sitting still for 20 minutes and not doing anything stresses her out even more. But your brain like any other part of your body needs a chance to rest and recharge in order to be able to do it’s best work with positivity and creativity. Herein enters the idea of flow. Flow is not a new concept. It was coined in the early 1980’s by a psychologist named Mihaly Csikszentmihályi. You may of heard of people referring to flow as “being in the zone.” Flow usually happens when you are doing an activity for which you have the skills and knowledge but also is slightly challenging for you. Flow is an active process (rather than something like meditation or relaxing in the hot tub). Your brain is engaged and challenged and you seem to know exactly what to without hesitation. People who experience flow often report loosing track of time because they are so immersed in what they are doing. It is also sometimes called “The Deep Now”. Here’s the part I think is really cool. The idea of flow has been around for awhile now, but more recently they have been able to study brains of people who are in a state of flow. The original hypothesis was that much of the brain would be active while in flow in order to create such a state of optimum engagement. What they found was actually the opposite. When a person is in a state of flow much of their brain actually shuts down leaving just the part that is focused on the activity engaged. The prefrontal cortex – which is the part of our brain that houses our ego, our inner critic, our constant commentary – shuts down. Leaving us with the ability to be more confident, more creative, braver and focused. At the same time our brainwaves also slow down – going from the fast moving waves we have while moving through our normal busy days to a much slower speed found between daydreaming and REM sleep. We also get a flood of wonderful neurochemicals. A heady mix of endorphins, dopamine, serotonin. And this optimum state of being lasts past just the time we’re doing the activity. Studies have shown that not only are people more creative when they are in a state of flow, they are actually more creative the following day! What are the times in your life when you have experienced flow? I’ve been in a flow state while running, writing, drumming, reading. I know my husband finds it when he goes mountain biking or skiing. Often people report finding themselves in flow when making art or dancing. Usually flow is great not only for our brains but we enjoy it, it builds our self confidence because we are excelling at something that is slightly challenging. We feel happier. There are so many reasons to find and make time for flow in your life! It might be possible to take flow to an unhealthy extreme – to get so immersed in what you are doing you loose track of time and forget to take care of your body or pick up the kids from school. If you find you have that tendency I’ve heard the suggestion of setting a timer so you know when to stop. But when used in a productive healthy way flow might be just the thing to helps part of your brain put the endless chatter on hold and finally take a well deserved rest. For more tips, tricks and inspiration for living a happy, healthy life sign up for my monthly newsletter. We are all trying to navigate this new political climate in our own way. For me I’m trying to take at least one positive action a day for the world and also for my sanity and well-being. I’ve also been trying hard to replace anger with curiosity. The question I’ve been mulling over a lot lately is how did we get to this place? How can we create a culture that invites conversation over argument when there seems to be such a huge gap between our beliefs? I came across this Ted Talk last night that I thought was fascinating. If we really want to move forward as a nation I think it’s important that we take a closer look at our mindset. That we try to shift from the feelings of “we’ve got to beat them,” to “we’ve got to reach them.” Being angry can certainly fuel action, but it seldom convinces someone to see things from your point of view. Now I fully admit to having lived my whole life on the left coast. I’m positive my way of looking at the world has been shaped by that. Most of the people I’m surrounded with have a similar world view as I do. But still I have a few aunts and uncles that I’m pretty sure have a very different take on things. I’m pretty sure their environment has shaped their views as well. I know them to be good people who love their children. I have hobbies in common with them. We’ve known each other our whole lives. We’ve celebrated lots of holidays together over the years. The idea of calling up these relatives and engaging in a political conversation is overwhelming. It makes my stomach clench. Just the thought of it makes my shoulders tense and my heart beat faster (Wow! Instant physical reaction even without the actual interaction). There are issues I feel so passionately about that I’m not sure at this moment in time I could rationally and calmly have a political conversation with them. I can however imagine calling up my uncle and asking for that awesome blueberry salsa recipe that he made last time he was visiting. Maybe it’s not a conversation that will be world altering, but at least for me personally it’s a start. A reminder to both of us that there are real people that we know and love behind the political labels and party lines. I’m not saying I think people should just get over it so that everyone will get along. I’m not saying we shouldn’t feel passionately about world issues or that we shouldn’t turn those feelings into phone calls and letters and emails and action. But there is a big difference between action and anger especially when it comes to our health and well-being. One empowers you and the other breaks you down. One reaches out and the other pushes away. I have another aunt I love on the left side. She is very politically involved. She puts in long hours volunteering for her party. She is up to date on the issues. She reaches out to people to make sure their voices are heard. When we lost the election I was worried she would be hit hard. She had poured so much time and energy into the effort. I tentatively asked my cousin how her mom was doing. “Better than the rest of us!” I was so surprised by the answer. But now thinking about it I wonder if it’s because she is used to having these conversations. She is more aware that there are people out there with different ideas. I need to ask her about it, but I wonder if she like me is excited that even though we may not have the president we hoped for we now have a huge uprising of people who are getting involved, speaking out, learning about the issues. Yes we can view it as a stressful, scary time. We can focus on the things that might happen (but haven’t yet). But when we do that we cause ourselves to essentially live in a reality we don’t like prematurely – think of me getting stressed out just by the thought of having a conversation with relatives that hasn’t even happened. When I imagine it happening the stress to my physical and mental health is the same whether or not that conversation takes place. I’m the only one who is negatively effected, not my uncle and aunt who don’t even know this is going on in my imagination! So for my part I’m going to try my hardest to focus on the incredible and exciting positive response we’ve been seeing from people getting involved in the political process in a way that I’ve never known in my lifetime (thank you Mr. Trump!). I’m going to reach out to my friends and relatives on the other side and remember that they are good humans who have been shaped by their environment just like I have. Eventually I’m going to try to have some conversations with them through the lens of curiosity. I’m going to remember that one person doesn’t define a nation, that it’s all of us and our voices that do. I’m going to use mine! Be happy, be health, be well. Friends I urge you now more than ever to attend to your health and well-being! There is a lot going on in our world right now, but feelings of anger, frustration, overwhelm or depression experienced over extended periods of time is incredibly damaging to our health. I have loved this quote from Bansky for a long time. But I used to look at it in a different light. I used to think that his words of encouragement were solely for the people out there who were ready to throw in the towel and give up. I see it in a slightly different light these days. The sort of change we are looking for in this world is not going to happen overnight. We need to be in it for the long haul and in order to do that it’s vital that we are taking care of our bodies, our minds, our souls. These days when I think of Bansky’s words I see them as a reminder that rest is a nonnegotiable part of pushing forward. Rest is just as important to learn for the people who don’t ever want to quit. Please. Don’t give up! Don’t stop taking action! Don’t quit! But I want you here for the long haul. The world needs you here for the long haul. If we let the stress of the world break us down then essentially it wins. Learn to rest. Take time to turn off the television, stop scrolling through your news feed, have conversations about something else going on, walk away for a little while. Don’t forget your body when your mind is constantly clamoring for your attention. Eat well, move, sleep, breathe deeply, go outside. All of these things don’t mean that you are being neglectful or lazy or shortsighted. It’s the opposite! Because you and I know that by taking breaks and learning to rest you will be here to show up for a long, long time. And that’s exactly what this world needs. A free gift for you - spend a few minutes each morning filling out this worksheet for an intentional, beautiful day. Click on the image to download. Let me help you discover, dream, design and meet your health and wellness goals. Together we will create a vision for the life you want to live and design a plan to get you there. I love the fact that each person is unique and walks a different path to living their best life. Let me help you find yours! Loving the gifts from the garden these days! Getting ready for a little #notech90. Since I try to make it to bed by 9:30 that means shutting down the devices by 8:00. Definitely earlier than I normally would. But it’s a beautiful night and I have a good book. Have a lovely evening all! @trustysidekickadventures @chopperanddutch @drchatterjee. You guys still with me? It's easy to get caught up in comparing ourselves to others!My latest article published by @livewellcollective gives some tips on how to step out of the comparison game for a happier, healthier life.